Get your Ghoul on! Halloween 2013 - CTS Wholesale LLC. Time to find your fangs, broom or hockey mask...whatever your penchant, October is the time to get your Ghoul on! This is also the time to get your gear and ring up some extra sales. Halloween is only 30 days away! Tricks or treats, CTS has you covered! You'll find our range of spooky lighters and creepy hologram sunglasses will be right on target. If you're looking for a little something extra for your original costume, browse our range of Party Glasses, where you'll find spider web, bat-eyes, and even Court Jester glasses that will be perfect! 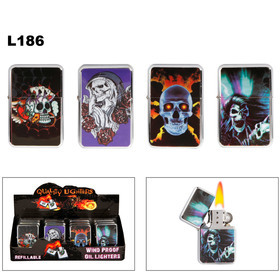 If you're running a convenience store, you'll most likely be interested in our range of wholesale lighters that fall into the Halloween theme. These lighters are refillable and you have the option of buying by the dozen, or individually. Our Steel line starts at $12 a dozen, while the Brass line is sold individually and includes a metal tin with each lighter. Each has a selection that will fit right in with the spirit of this holiday. And then of course you have our range of eyewear that will be fun for parties or treats, and several that will make a great costume even better. 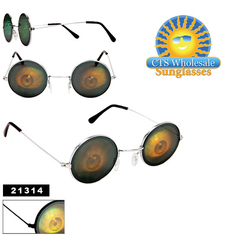 If you just want to get into the mood, try our skull and cross bones hologram sunglasses, which have glass lenses. Or our crazy eyeball set, if you're just looking to creep someone out, these will definitely do the trick! You can view our full range of spooky products easily from our Halloween Category, here.